THE BARMEN-ELBERFELD RAILWAY BY DAY. Placed centrally above the waterway, the track is supported by A-frames, as seen above. The span between the supports varies, but is generally from 68 ft to just over 108 ft. Including supports, the weight of the track is about 2,000 lb per yard. 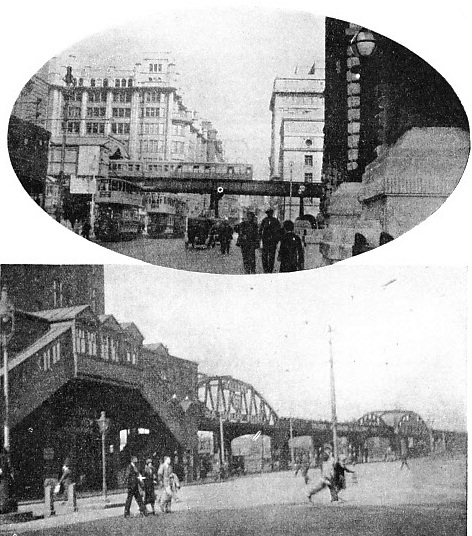 THE elevated railway, which is not to be confused with aerial railways, was intended for short-distance passenger traffic in urban areas, where it has helped to solve many problems. The importance of such lines is as great as the mileage is small. From early in its history the railway has gone above ground as well as on the surface. The initial section of the first public railway to enter London - the London and Greenwich - was carried on more than 500 arches so as to pass clear of street level. It is a tribute to its builders that so much of the original construction still survives, although the collapse of two arches, just before the opening of the line, which was due to the premature removal of the shoring by the contractor’s men, started a long controversy as to the stability of the whole structure. Those fears were unjustified, and the London and Greenwich now forms part of the Southern Railway, a large proportion of which company’s mileage in the London area is still carried on arches. This method of construction was, in South London, due to two causes. The area was densely populated, and the cost of acquiring land and property to enable the lines to be built on the surface was prohibitive. Further, it was necessary to elevate the tracks to a level at which they could eventually be brought across the Thames to the terminal stations on the north side of the river. In certain cities there has for many years been a close connexion between the overhead and the underground railways. Part of the “Hammersmith and City” section of the Metropolitan was opened to traffic as early as 1864, only a year after the inauguration of the initial portion of the Metropolitan. A relatively large mileage of this system and of that worked by the Metropolitan District is built on arches, so that London’s Underground employs the three methods of subterranean, surface, and overhead construction. OVERHEAD RAILWAY TRACK passing over a bridge across the Wupper River in Elberfeld, Germany. The line connects the towns of Elberfeld and Barmen, running for a distance of eight and a half miles. It was opened in 1901, and the cost of construction averaged £53,000 per mile. Cars are electrically operated, and signalling is automatic. The line has eighteen stations. The last system was chosen largely because of the contour of London. There is a cont-inuously rising gradient from Hyde Park to Hampstead, so that while the natural route for a railway on one section is below ground, on other sections less difficulty is involved by elevating the line, as has also been done on the newer sections of the Hampstead and Piccadilly Tubes. Another factor is that an overhead line is considerably cheaper to build than a line in a tunnel. Paris, Hamburg, Boston (USA), Berlin, and New York are among other cities in which urban passenger traffic travels above the surface. A characteristic of the Boston system is the use made of the reversing loop. While differences of opinion still exist as to the relative advantages of the loop and the cross-over for the quick handling of trains at terminal stations, considerations of cost make reversing loops beneath the surface almost out of the question, although Kennington Station on the London Underground provides an exception. This is, however, a junction, and the loop is supplemented by the customary cross-overs. The original scheme to build a reversing loop beneath Euston Station for electric trains was abandoned. If the loop is to be regarded as advantageous, then the elevated railway has at least one point of superiority over the underground line. The connexion between overhead and underground railways exists also in Berlin, where part of the transport system consists of a once independent undertaking known as the Hoch und Untergrundbahn, or “High and Underground Railway”. The use of both methods of construction was here planned from the outset, and the line, which was opened in 1892, has a feature that calls for inclusion in any record of railway curiosities. At one point it cuts through part of the lower stories of a dwelling-house, which was otherwise left undisturbed. Close by is the “Dreieck”, or triangular junction, which is Berlin’s equivalent to the Boston reversing loops, and has greatly added to the flexibility of the system. The railway now consists of five main sections and a number of branches designed as feeder lines to the main network, has a total route length of about fifty miles, and was from its opening electrically operated on the multiple-unit system. It is partly carried on steel bridges, some of the skew pattern. Although developments have taken the short-distance passenger railway underground. New York has for many years been identified with the elevated railway. The beginnings of the “L”, as it is called, were in a small way, in 1870, when three miles were opened to traffic. Eighteen years later the system crossed the Harlem River. To-day its tracks extend to well over a hundred miles. Before electrification the steam locomotives in use - of a design somewhat unfamiliar to British eyes - were among the principal contributors to the noise of New York. Part of the elevated system is three-track, the middle road having been designed for reversible working during the various rush hours. THE PIER HEAD STATION on the Liverpool Overhead Railway. This line is six and a half miles long and follows the bank of the Mersey. Fifteen of the sixteen stations serve the docks. The choice of the elevated method of construction in New York, as in London, was dictated by special conditions. The city is built on a long and narrow-island, so that expansion has to a large extent been vertical; instead of buildings being pushed out laterally, skyscrapers have gone up into the clouds. Such concentration would, in any event, have given birth to specialized traffic problems - those of New York are in many respects unique; and when it is borne in mind that a single block of skyscrapers in the business district can house the population of a town, and that all its occupants travel to and from their work during a restricted period of the day, the task of handling the resulting intensity of passenger movement presents unusual difficulties. To this have been added geological problems. New York is largely built on a foundation of rock, and the task of excavation and tunnel building has brought with it far greater difficulties than are encountered when boring in the London clay. 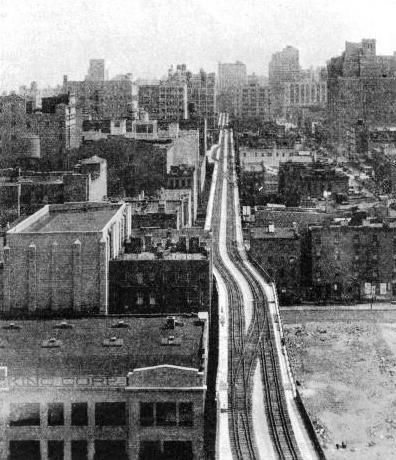 It is understandable that the overhead railway should have preceded the underground line in New York, and also that so much of the “Subway” should have been built at only a shallow depth below street level, and constructed on the cut and cover principle. THE STEEL FRAMEWORK of the Liverpool Overhead Railway carries the lines some 16 ft above the road. This picture gives a good impression of how the track crosses busy thoroughfares. The Liverpool Overhead Railway was opened for traffic in 1893. It was the first overhead electric railway in the world, and the first electric railway of industrial importance in the United Kingdom. Except for the New York Elevated, we have so far been considering railways that are above ground for only part of their length. Unique in that it traverses a great city and runs above ground for its entire length is the Liverpool Overhead Railway, the initial section of which was opened for traffic in 1893. This line was electrically operated from the start, and was the first overhead electric railway in the world. 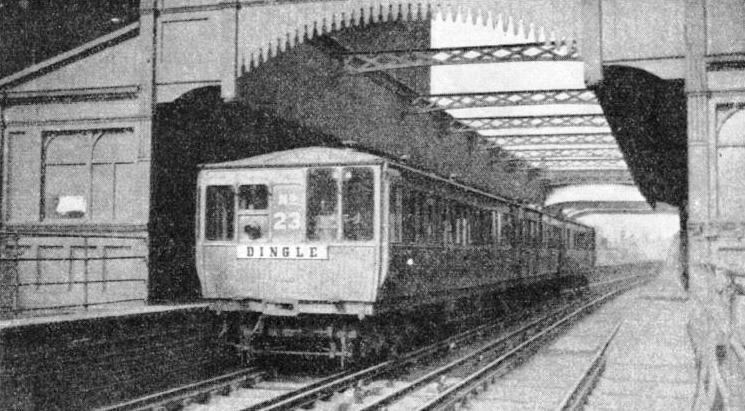 It was the first electric railway of commercial importance in the United Kingdom, although the Brighton Electric and the Giant’s Causeway and Portrush lines were opened ten years earlier. The reason for this railway, which is six and a half miles in length and was a pioneer in the use of automatic signalling, was the Liverpool dock system. The line follows the west bank of the Mersey, and fifteen out of its sixteen stations serve the docks. The system was not originally promoted by a railway company, but took over Parliamentary powers first granted to the Mersey Docks and Harbour Board under two Overhead Railway Acts. A spur line was built in 1905 to permit of through working to and from the then Lancashire and Yorkshire’s Liverpool, Southport and Crossens electrified line, and such a service was regularly provided until 1922, when it was withdrawn owing to road competition. But once a year, on Grand National Day, a special through service is still maintained by the Liverpool Overhead to and from Aintree. Overhead railways may be divided into two classes: those in which the ordinary methods of building and track construction are employed, and those involving the use of a specialized form of track work. In the second category was the little Listowel and Ballybunion Railway, in Ireland, a pioneer among monorail systems. This line, which had a length of ten and a quarter miles, was not very successful, and ceased working in 1924. The monorail system employed was that of Lartigue, in which the main or running rail was carried on a series of trestle-like supports, while the engines and coaches were suspended on either side of the main rail, like panniers on the back of a mule, the upper rail serving to carry the load. This unusual method of traction required loco-motives and rolling-stock of unconventional design. The disadvantages of the system is that it is not suited to heavy traffic, although that was not a consideration on this line, while the principle of construction is not particularly well adapted to shunting or switching movements. Those difficulties were not, however, responsible for the closing of the line; but, as has been so with many other small Irish railways, the traffic was insufficient. The Listowel and Ballybunion Railway was a cross between the surface line and the elevated railway proper, since its clearance above road level was much lower than that of the overhead systems described above. It may also be regarded as an intermediary between the orthodox method of rolling-stock design and that in which the wheels are placed above the vehicle, of which the best-known example is the Elberfeld-Barmen Railway in Germany, which connects the twin cities that give it its name. This line is carried well above street level, and crosses a river. The cars are slung from electrically-driven motor trucks that travel on the upper rails, and the principle is in effect a development for railway purposes of a type of conveyer that has for long been used in factories and mines for the transport of ore and other heavy material. 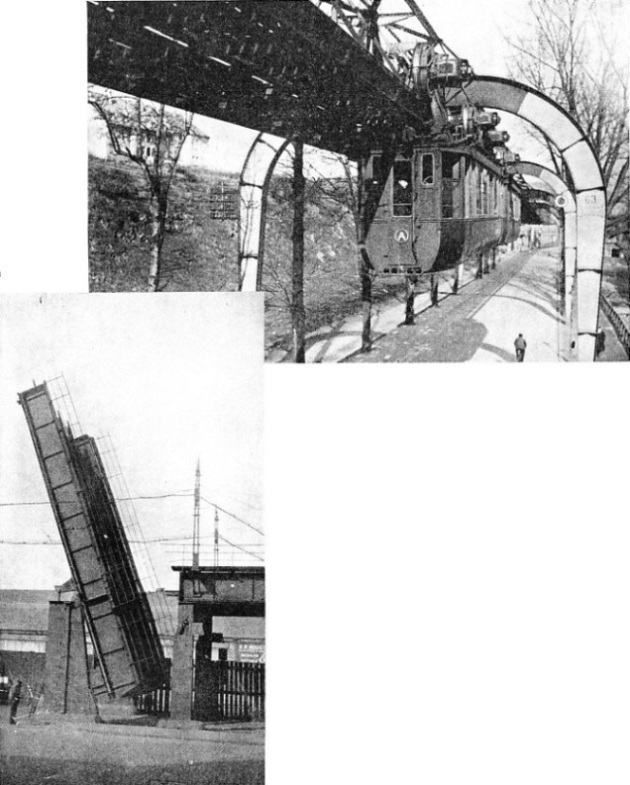 In this form of conveyer a truck runs on an overhead rail, and a sling attachment handles the load. The Elberfeld-Barmen line has given good service, and represents an ingenious and successful attempt to solve the traffic problem of the locality. One of its peculiarities is that the platforms are built to an exceptional height, owing to the design of the vehicles. The elevated railway and the monorail largely go together, but when it comes to the monorail designed for very high speeds, progress to date has been more in the form of plans and models than in realization. Louis Brennan, better known in connexion with torpedoes, in 1907 demonstrated on his lawn a gyroscopic car running on a single line of rail, and needing no guide rails to support it. The vehicle was also able to travel on an even keel when running on a loosely supported cable. The principle of the gyroscope is that if a flywheel is mounted on a vertical shaft and caused to revolve at very high speed, it will defy every attempt to force the axis out of the perpendicular. A somewhat similar vehicle was exhibited two years later by a German, August Scherl. But both Brennan and Scherl were before their time, and the idea languished for want of support. You can read more on “Underground and Overhead Lines” in another chapter. ABOVE A PUBLIC HIGHWAY. Although most of the Barmen-Elberfeld overhead line runs above the Wupper river, almost two miles of it are over road. 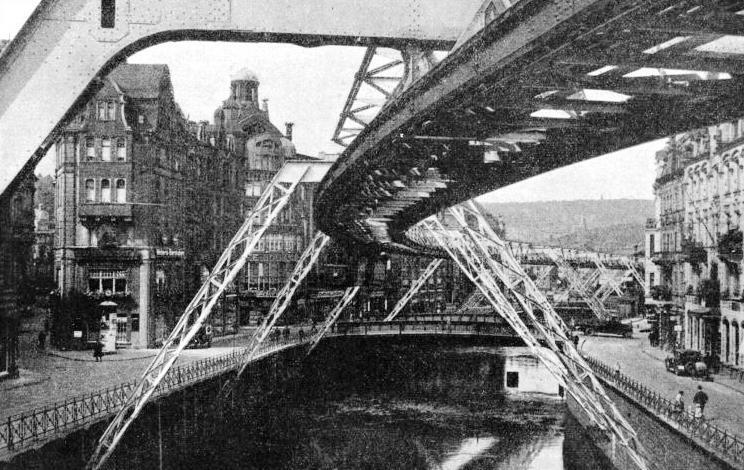 The permanent way is supported here by U-shaped supports giving less interference to traffic than would the A-shaped type as used over the river. 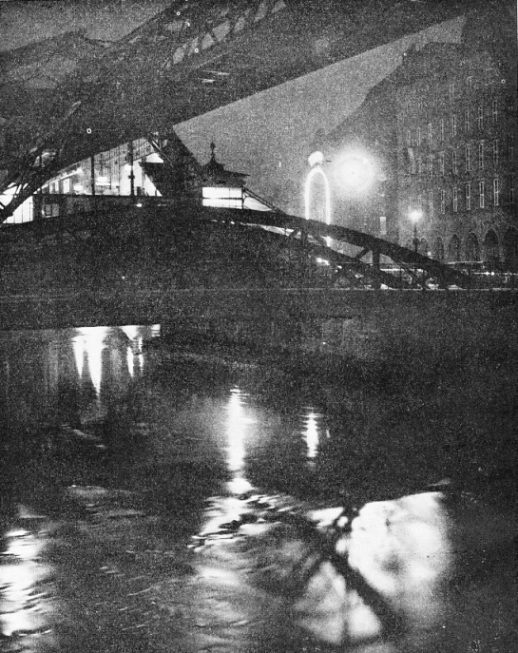 A TILT BRIDGE on the Liverpool Overhead Railway. At some points movable bridges over the docks have been built to give passage to the shipping that is continually passing in and out of the port.